Kurt Andersen wrote a great article at Vanity Fair detailing how American culture hasn’t changed in the past two decades. He goes into a lot of detail, covering art, fashion, industrial design, architecture, but I’ve noticed this specifically about music, or at least popular music. No genre has dominated music — and consequently style — since grunge and gangster rap in the early 90s. These are generalizations. Yes, the 70s produced more music than just disco. Yes, rap was around long before Dr. Dre. Yes, pop-punk had a good run in the late 90s. But I’m looking at Top 40 cultural phenomena. When you think 70s music, you think disco. When you think 90s music (and you’re white), you think grunge. When you think 00s music, you think…of nothing in particular. When I bring this up, a lot of people tell me that “pop” is the defining genre of the 00s, but that’s some kind of weird recursion. “Pop music” is exactly that: popular music. We only call Ke$ha “pop” because she doesn’t evoke a better description. Other than production quality and vernacular, how different is a Lady Gaga song from a Madonna song from a Gloria Gaynor song? “Pop” is too generic to incite a movement. It’s just furniture. What else? R&B hasn’t changed. Rock hasn’t changed. Country hasn’t changed.1 Electronic hasn’t changed. And I can’t think of a single genre in Top 40 music today that wasn’t around twenty years ago. Can you imagine Nickelback on MTV in 1992? Of course. Can you imagine Soundgarden on American Bandstand in 1972? Not one bit. In some large measure, I think, it’s an unconscious collective reaction to all the profound nonstop newness we’re experiencing on the tech and geopolitical and economic fronts. People have a limited capacity to embrace flux and strangeness and dissatisfaction, and right now we’re maxed out. So as the Web and artificially intelligent smartphones and the rise of China and 9/11 and the winners-take-all American economy and the Great Recession disrupt and transform our lives and hopes and dreams, we are clinging as never before to the familiar in matters of style and culture. 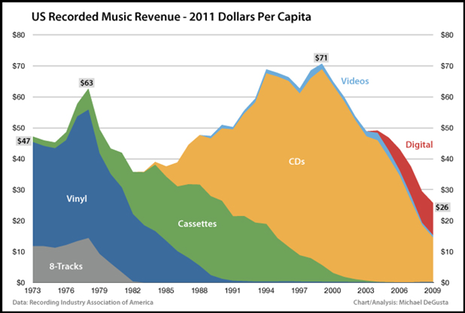 Revenues dropped precipitously around the turn of the century, inarguably because of Napster and affordable high-speed broadband. But Napster was more than just a means of mindlessly stealing songs: it democratized the process of discovering music. exist on a social network. We have such sophisticated artificial and human recommendation engines. Why would you listen to a generic radio station that’s required by contract to rotate the same nonsense day in and day out? The early 90s were the last stand for Clear Channel radio and big music. Back then, if they decided to make something huge, they could push it to every radio station and MTV affiliate in Western culture. Now our attention is too divided. They can push the songs, but the people who hear them aren’t the trendsetters. Maybe they’ll buy an album or a ticket, or most likely a single, but there’s just no culture behind the music anymore. Plenty of artists are still releasing great music. I’m not arguing against that. Some of it even goes mainstream. I just don’t think that we’ll ever again witness a sea change in popular music like we did repeatedly throughout the 20th century, and we’re no worse for it.